Laparoscopic sleeve gastrectomy is a restrictive weight loss surgery procedure. In this surgery, 85% of the stomach is exceised. The remaining portion of the stomach is about the size and shape of a banana, hence the sleeve name. The new capacity of the stomach ranges from about 2-3 ounces (60 to 150 cc). The outlet valves and nerves to the stomach are left intact meaning that stomach function is not compromised despite the procedure. The sleeve gastrectomy is not a reversible procedure and the exceised portion of the stomach is removed outside the body. The vertical sleeve gastrectomy is a great option for weight loss as a standalone procedure or as a first step procedure in the super obese patients. 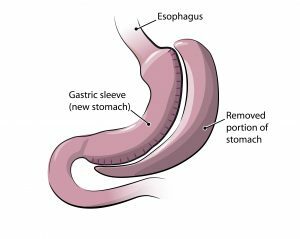 For patients who are extremely obese, the gastric sleeve may be the first of a two part surgery or be performed on its own. Because stomach function is not compromised, the procedure requires fewer food restrictions after surgery. While the quantity of food consumed is reduced, the removal of the majority of the stomach also reduces the hormones that stimulate hunger. The gastric sleeve does not involve the modification of the small intestine and patients will not experience intestinal complications such as intestinal obstruction, anemia, osteoporosis, vitamin deficiency and protein deficiency. For patients already suffering from these diseases, gastric sleeve is ideal because it will not aggravate the condition. Since the pylorus is not cut away, dumping syndrome is less likely to occur. Minimizes the development of ulcers. Provides an alternative surgical procedure for certain high risk patients. Provides a laparoscopic solution to patients with a particularly high body mass index (BMI). The vertical sleeve gastrectomy does not offer as significant a weight loss as gastric bypass. Indeed there is a possibility of weight regain after surgery. Staple leakage is a very serious complication that could require hospitalization. As with any major surgery, additional risks can include post-operative bleeding, small bowel obstruction, pneumonia and even death. Since there is no intestinal bypass, weight loss may not be as great as other surgical procedures. Patients with extreme BMI may need to have a second surgical procedure to reach their weight loss goals. The procedure is not reversible. Surgery for Extremely Obese Patients: For patients with extreme BMIs, the gastric sleeve is a relatively easier procedure to perform. As a result, the sleeve can be performed as both a standalone procedure and the first of a two part process. For obese patients with a relatively lower BMI, the vertical sleeve gastrectomy can be preferable, especially when conditions such as anemia or Crohn’s disease prevent other bariatric procedures from being performed. Patients may prefer this surgery if they are concerned about the long-term effects of bypass surgery or if they do not want a foreign object in their body as in Lap-Band surgery. Vertical sleeve gastrectomy, sleeve gastrectomy, greater curvature gastrectomy, parietal gastrectomy, gastric reduction and vertical gastroplasty.